Award-winners Asmund Borgen Gjerde (L) and Danilo Scholz. The EUI’s Marc Bloch Prize in Early Modern and Modern European History has this year been awarded to academics from EHESS Paris and the University of Oslo. The biannual award, which is now in its fifth year, was presented on 15 April and celebrates the best new MA thesis in early modern, modern or contemporary European history and in the history of Europe in the world. Danilo Scholz, from EHESS Paris, was awarded the prize for his thesis entitled ‘Alexandre Kojeve et la philosophie allemande: l’homme, l’histoire et la politique (1926-1947)’. Fellow winner Asmund Borgen Gjerde’s University of Oslo thesis is entitled, ‘Reinterpreting Soviet ‘anti-Zionism’. An analysis of ‘anti-Zionist’ text published in the Soviet Union, 1967 to 1972’. 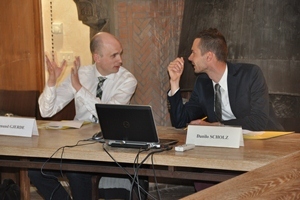 The selection committee was made up of EUI professors Laura Downs, Pavel Kolar, Luca Molà and Lucy Riall.